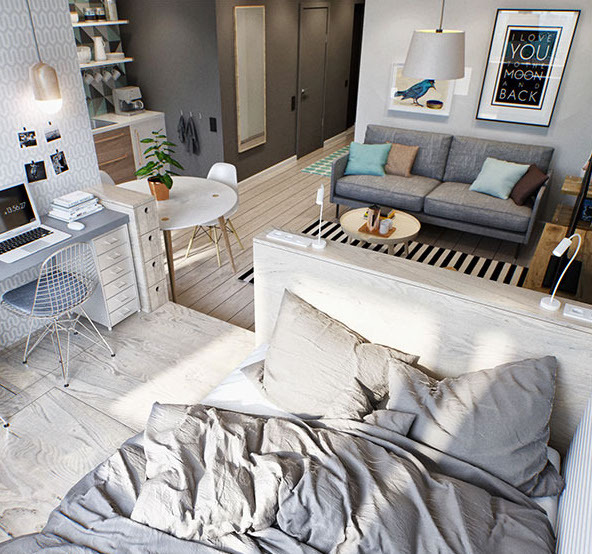 Ideas for making small spaces seem larger! 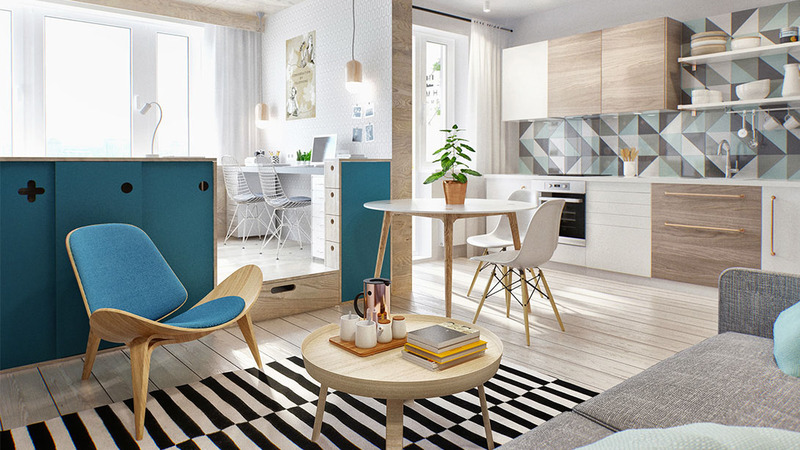 Most of us are troubled with small spaces, but there is really no need to put up with them. 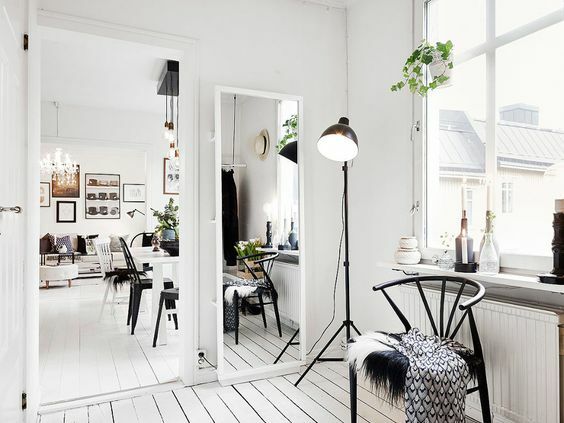 Whilst enlargement and renovation may be out of the question, there are a few tricks that you can employ to make your small spaces seem larger and which are easy to implement yourself. I perhaps mentioned this tousand times but you should know by now that I live in the tiniest apartment ever, despite having 2 bedrooms which one is totally cramped! Yep, with all my landlord stuff that I have put there, so I could replace furniture in other rooms! Sacrifices! First of all, you have to understand that dark colours “close” in an environment while light colours “open” it up. Therefore, never use dark colours, such as dark purples, greens or reds in a small space as these will make it look and feel even smaller. Instead, paint the walls in light colours, such as white, light blues and pinks, or even a dove grey to create a light and airy space. I probably talked about it over and over again, but because I am like you tutor you know 😉 Annoying but useful!Just look at my the choices below. Isn’t it the perfect ‘pink’ shades?! I hear you! 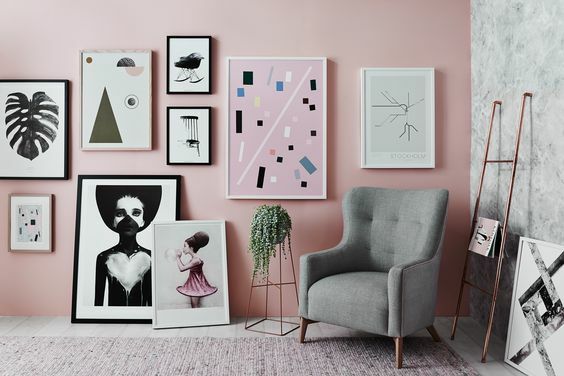 Great examples of adding artwork onto pink walls! 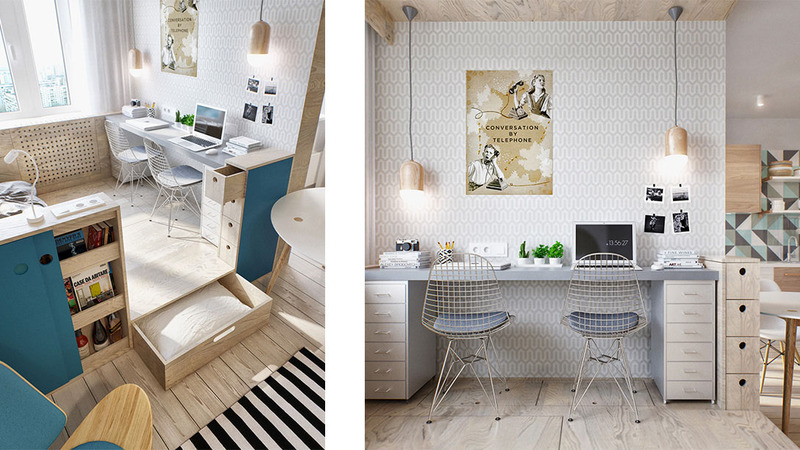 Another great examples from INT2Architecture, these guys designed the small space appear larger with such a style! It can be tempting to think that making space in the centre of the room by pushing furniture to the walls is a great way to make a small area seem larger, but think again. 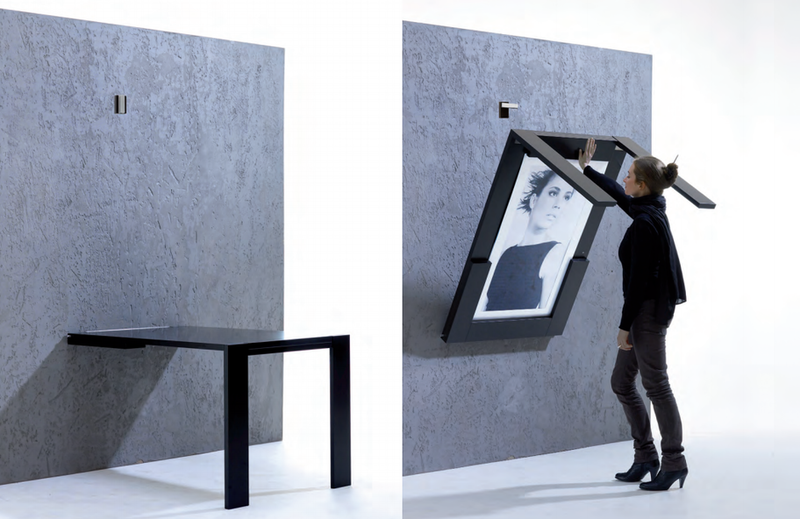 It could just make your small room look empty and uninspired. Instead, try planning a furniture layout that uses angles and centre placements. If you joined me at my Ideal Home Show talk, I have explained that little more! For example, in a home office, angle your desk across two walls and position it so that you look into the room rather than staring at the walls. For living rooms, place a large sofa in the centre with a narrow console table behind it. Remember to allow for walking space around your furniture. Let your space breathe and don’t just cramp around the room living the centre empty! It’s a crime! Another quite important part! I talked before about windows before and my idea of keeping them plain. 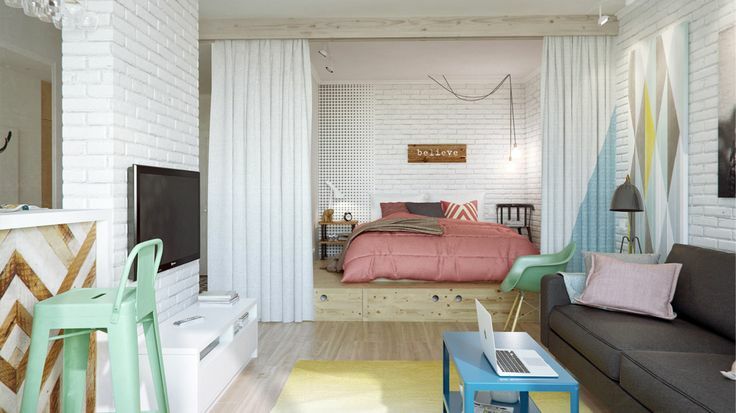 Your vertical spaces are just as important as your horizontal ones, especially in small areas. In regards to your windows, you should be aiming to reduce their visual impact rather than emphasising it. 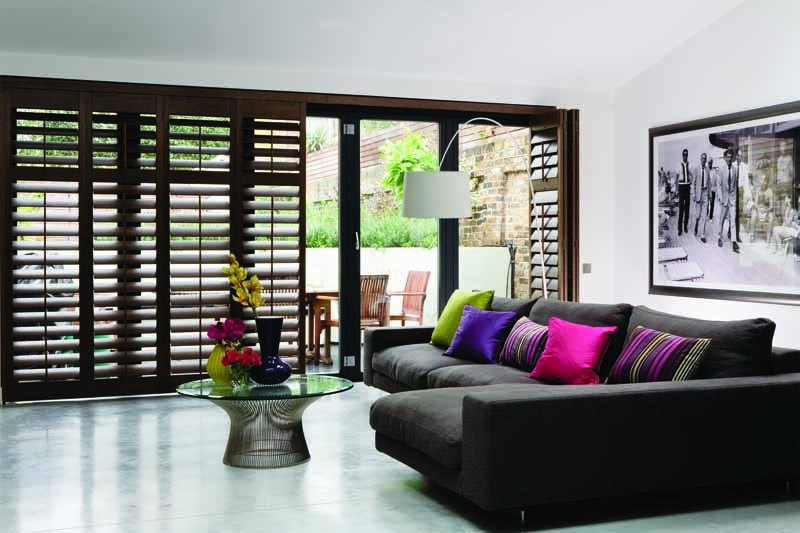 Instead of heavy, bulky curtains and blinds, install high-quality window shutters to create a streamlined window dressing that affords you privacy and gives you control over air flow and natural light. Of course, if you fan of curtains that;s a different story but just remember the quality over quantity. If you go for heavy textured curtains, then avoid too much patterns. If you prefer patterns then chose lighter curtain fabric! Easy to remember! A way to avoid cluttering your small space with multiple items of furniture is to choose items that serve a dual-purpose. Always choose furniture that offers storage over items that do not, such as a bed with a frame that lifts up to reveal a large storage space, or a footstool that not only provides extra seating but also opens up to offer storage inside. You should also opt for furniture that can be decreased in size when not in use, such as a dining table that has a drop-leaf. A clever trick that we interior designers do is the strategic placement of mirrors. Choose a large mirror, either width-wise or height-wise, and position it against the wall opposite to the window for maximum effect. Placing it here will create the illusion of another window, but if this space is not free, then placing a large mirror anywhere in the room will help to reflect light and thereby make the area seem larger than it is. I have 2 mirrors in my hallway corridor and the trick works! 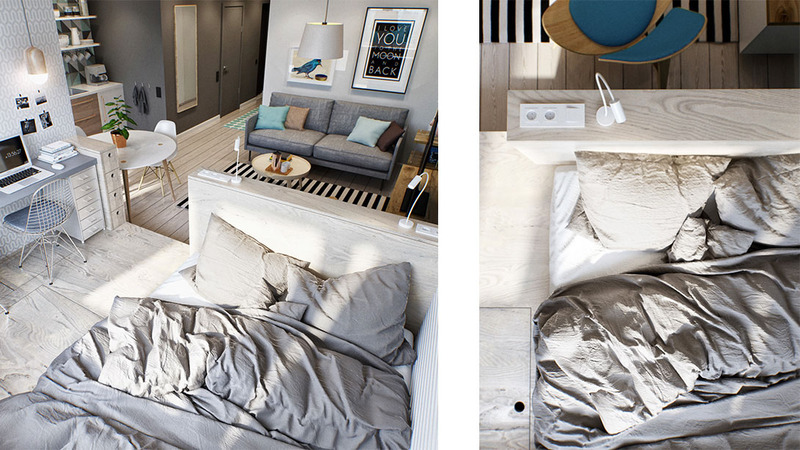 Another amazing example from INT2 Architecture, you can read here about the small apartment with love! The Alternative Valentine’s Day Venues that Will Make Any Girl’s Heart Sing! Great tips Anna, especially agree about using fold up and flexible furniture. This is such a great post! I'm so glad I have discovered your blog! I am always look for ways to make my tiny house more beautiful! So many good ideas, I think use of colour is so important to make spaces look bigger, and mirrors work well too. These are great tips! We are currently downsizing from a house to a flat so not only are we clearing the clutter, I'll be paying attention to your decorating and layout tips! !